Peter Young took this photo on April 7th 1973 - a spring day. It shows the Boatmen's Institute building, very much as it was when it opened (1904 postcard). Its location is marked on a 1930s sketch map - top left corner - and it can be picked out in an early 1900s postcard. 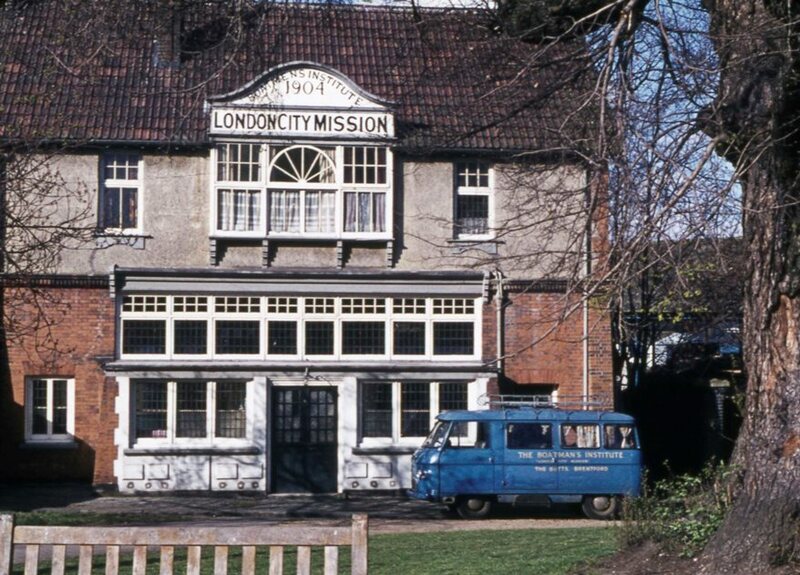 Closer examination of the 1904 postcard shows a signage change: whereas BOATMEN'S INSTITUTE was originally the more prominent of the two signs, by 1973 the main sign proclaimed LONDON CITY MISSION and reference to the Institue had been moved above it; however Fay Twydell's 1997 photo shows the original form had been reinstated. The other feature which catches the eye is the blue Commer van, signed The Boatman's Institute, London City Mission, The Butts, Brentford. Perhaps it had been converted to a dormobile?